I am very excited to start introducing the talented people involved in the creation of my upcoming EP Presenting Tara Shupe: Destroyer. 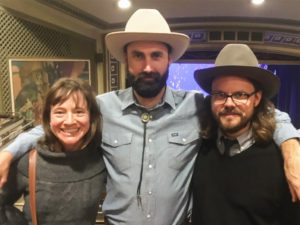 I was able to catch up with Tyler Lambourne and Daniel Young of Utah super group The Lower Lights last night for this picture. Tyler lives in Austin, TX, and was one of the "satellite" musicians I used for 3 of the songs recorded independently across the country by some of my favorite musicians. With basically nothing to work with, laying bass to guitar/vocal scratch tracks, he nailed everything. I'm beyond stoked with how it turned out. You can catch Tyler playing around Austin with Ragtime Willie and Texas legend Eric Hokkanen, to name a few.